wcpt.org | The paediatric physical therapist job description free download has space for the user to add the details of the job description, the job title and other information. This free of cost PDF file is easy to download and is also printer friendly. Users can easily edit this file before emailing it or sending it out. 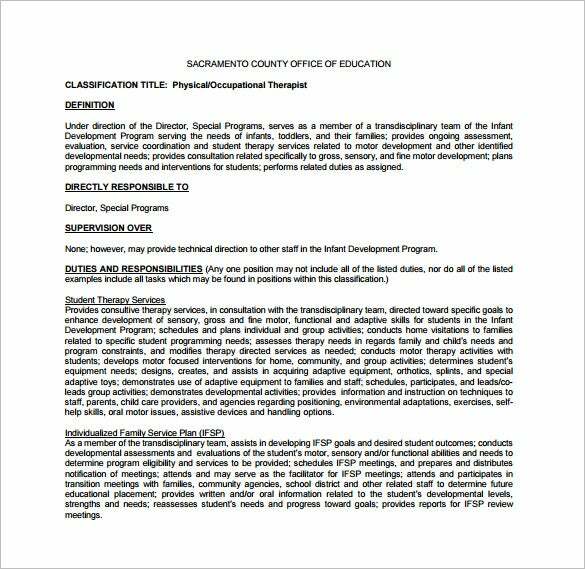 michaeljohnsonperformance.com | The sports physical therapist job description template can be used by a sports club looking to hire a physical therapist. It can also be used by state and national level sports teams that are looking to add a physiotherapist to their team. The template is a free of cost one and is easily editable. This printer friendly template can be also be emailed. 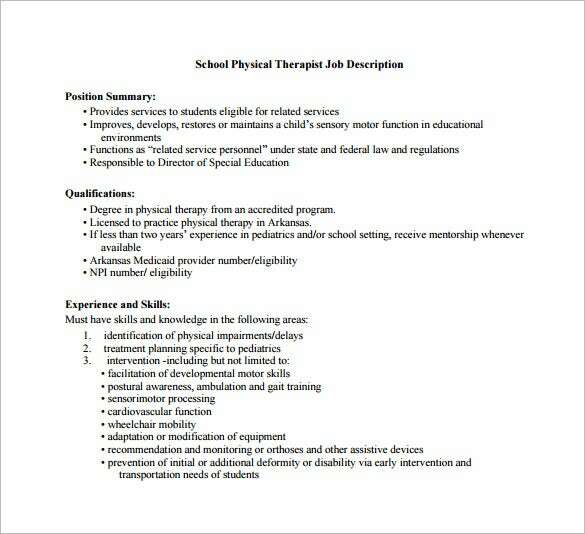 bentonvillek12.org | A school looking to hire a physical therapist has to be very particular about emphasising on the complete details of the job description of the therapist. 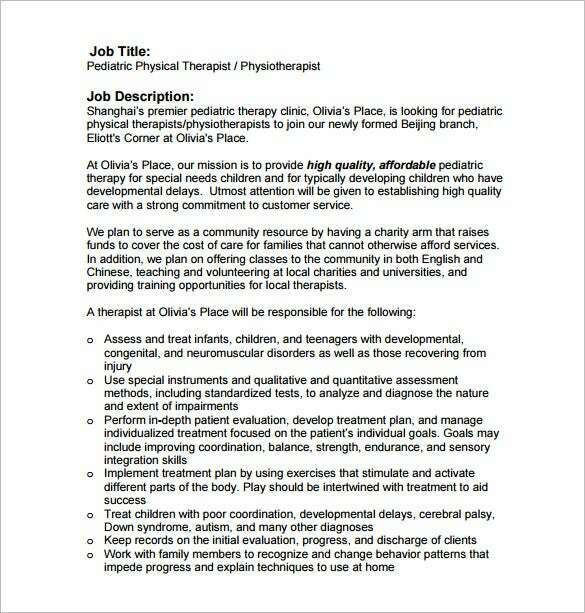 This school physical therapist job description template is ideal for this purpose. The free of cost PDF can be easily edited and emailed. It is a printer friendly template too. 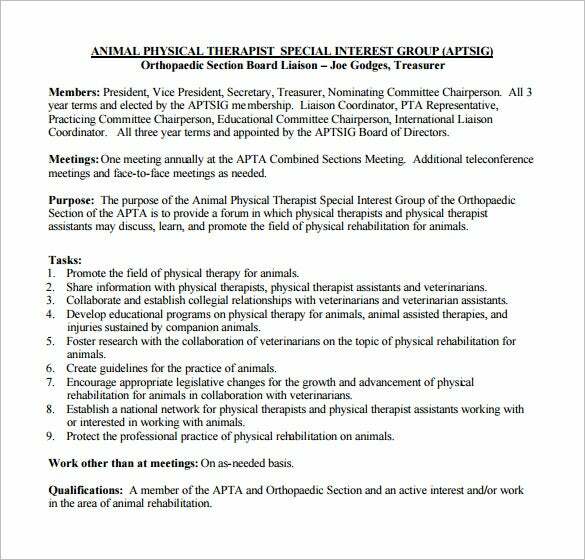 The physical therapist job description templates have various uses. For one the user can easily state the expectations that he has from the prospective therapist in this template. 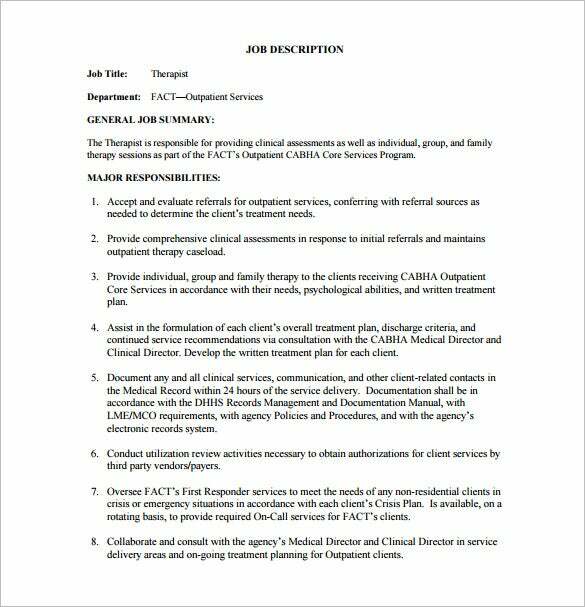 Additionally, the user can also mention through this template what duties and responsibilities a therapist will have to undertake in the event that he is given the job. Lastly the job description templates are useful because prospective applicants can instantly request for a proposal of the job description and decide without any further delay whether or not they wish to apply for the job. So this template is extremely useful for both the recruiter and the applicant. 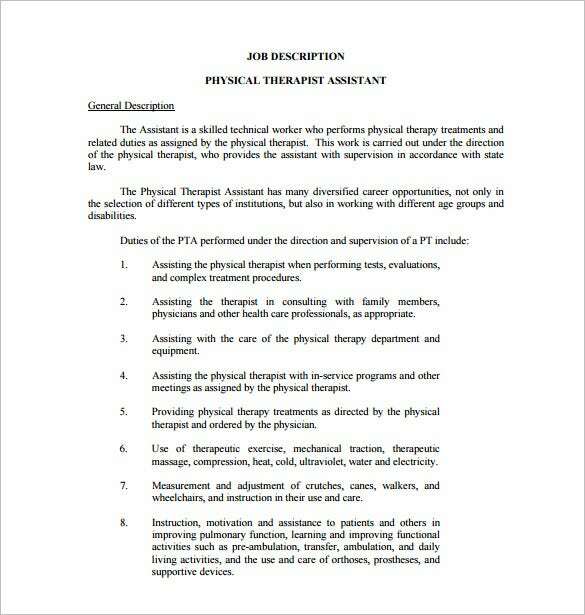 Who Can Use The Physical Therapist Job TemplatesThe job templates can be used by a large number of people and organisations. 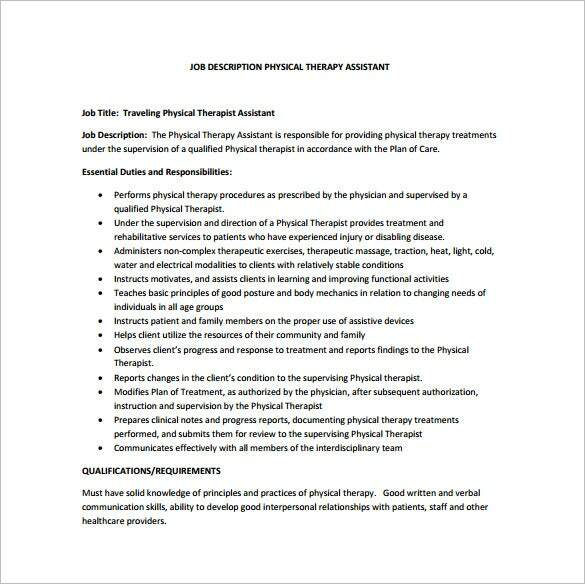 Typically anyone who is looking to hire a physical therapist can use these templates. From schools to sports clubs, medical centres, hospitals, doctors, gyms, spas, first aid centres and various others, these templates can be used by all. 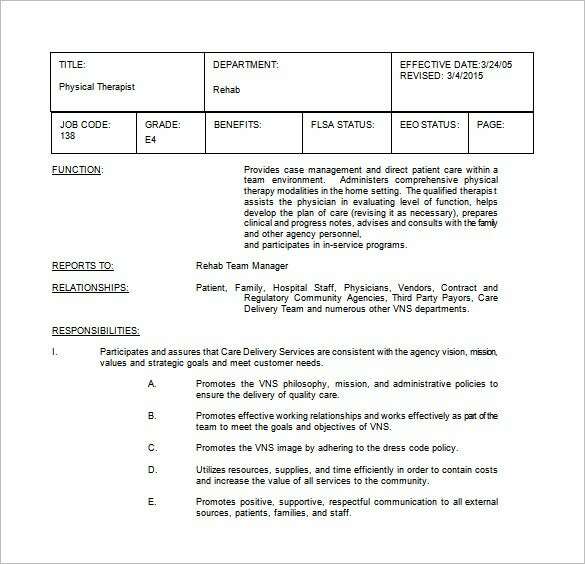 An already practicing physiotherapist who is looking to hire an assistant physical therapist can also use these job description templates to make it an easy, quick and effortless task. Thus, one can confidently say that these templates are universal and can be used by anyone. 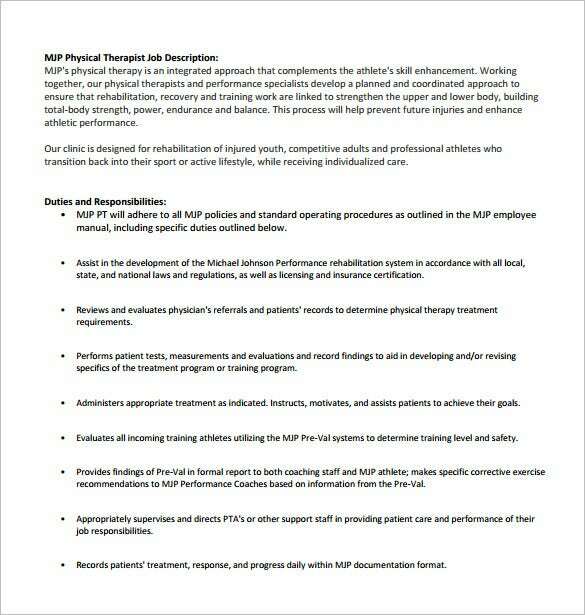 The physical therapist job description templates have several benefits. First and foremost the templates are pre-drafted and easy to edit, thereby reducing the work of the recruiter. Secondly the templates are absolutely free of cost, easy to download and can even be printed without any hassles. Lastly, these job description templates really prove to beneficial to organisations that are constantly looking to hire new physiotherapists on a regular basis. The ready to use proposal for the job description can just be sent out repeatedly without requiring the recruiter to draw a new one up each time. Sous Chef Job Description Template -16+ Free Word, PDF Format Download! 17+ Sous Chef Job Description Templates – Free Sample, Example, Format Download!